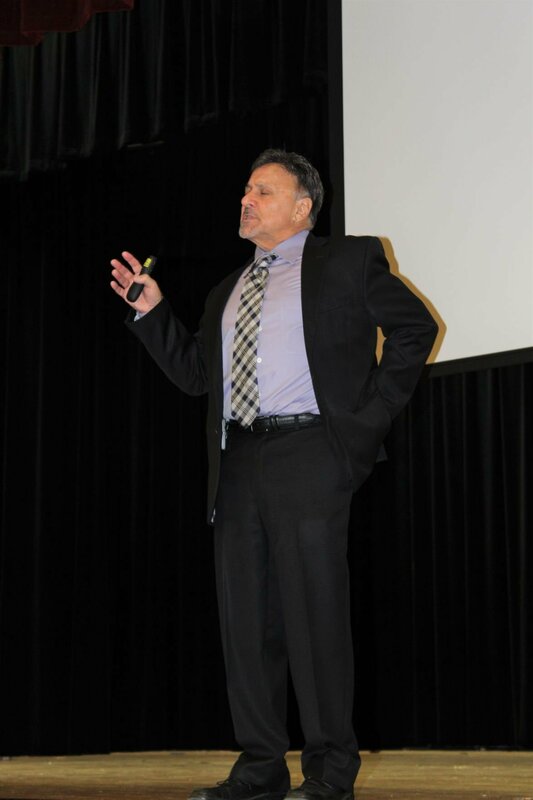 Context is what made Frank DeAngelis’s remarks at Clinton High School moving and powerful Monday. On April 20, 1999, two students, Eric Harris and Dylan Klebold, murdered 12 students and one teacher at Columbine High School. Twenty-four more were injured, three while trying to escape the Littleton, Colo., school. DeAngelis was the principal at Columbine on that day of infamy. He spoke at CHS as part of a day-long conference for teachers, administrators, parents, law enforcement officers and community leaders. It was geared toward them. Few, if any, students attended. Classes resume on Tuesday after the holiday break. The former football and baseball coach talked mostly about the lingering effects of that awful tragedy. Among the casualties were DeAngelis’s family. “It changed the way the kids looked at things,” he said. “They felt as if they had to live each day like it was their last. … Parents wished they had been more persistent in getting help for their kids. Security changed. DeAngelis said the killers became cult-like figures, citing 14 cases in which people visited Columbine out of fascination with school shootings and five in which they harbored their own plans of violence. DeAngelis, who retired in 2014, maintained a wall in his office – “The Wall,” with photos and information about the casualties – as a constant reminder of the tragedy. DeAngelis became ever more preoccupied, retreating from his relationship with his wife and daughter. Eventually, it led to divorce and a lingering estrangement with his child. Later she contacted him via email but said she still wasn’t ready for any other contact. DeAngelis sought counseling of his own and eventually remarried and rebuilt his life. As principal, though, he had to learn harsh truths about a generation of young people experiencing just as much trauma, much of which seemed invisible even to them, as he. He told of visiting “the smoke pit” where the have-nots congregated. “One kid told me, ‘You don’t know us. All your time is with the ‘A’ students, the athletes, the marching band,” he said. “I convinced him to get his friends to meet with me, no holds barred, and they did. They gave me the business. At his last assembly as principal, in 2014, DeAngelis said he figured out a way to fly and entered the gym from above, riding a guide wire to the floor. Now he tours the country, talking at other schools about his experiences and what he learned. The conference, which included two other principal speakers, was conducted under the auspices of the “I Love U Guys” Foundation, which was created to restore and protect the joy of youth through educational programs and positive action in collaboration with families, schools, communities, organizations and government entities.